In the aftermath of the Supreme Court’s verdict that invalidated the 99th Constitution Amendment, rendering nugatory the National Judicial Appointments Commission (NJAC), a popular narrative has entered our conscience: that the commission is not a credible alternative to the Supreme Court’s ‘collegium.’. The verdict upholds an extra-constitutional forum, created by the Supreme Court’s own members to serve its own ends, in the place of a system lawfully enacted by a popularly elected Parliament. The judgment fails to adequately answer the fundamental question at the root of the controversy: how is judicial primacy in making appointments to the higher judiciary a part of our Constitution’s basic structure? During the Constituent Assembly (CA) debates, Alladi Krishnaswamy Iyer had warned against vesting untrammelled power in the judiciary, which, he believed, could engineer the creation of a super legislature. This is precisely the role that the Supreme Court performed in the Second Judges Case, by effectively rewriting the Constitution to create a self-serving body, usurping powers from both Parliament and the executive. Appointment is an executive function. The Contradiction with in:- Justice Khehar also fails to show us how the removal of judicial primacy in matter of judicial appointments impairs the Constitution’s basic structure. The learned judge relies on the decision in the Second Judges Case to tell us that the word “consultation” in Articles 124 and 217 means “concurrence.” If so ,then there is no need of primacy as ‘consultation’ means ‘concurrence’ and ‘one vote equals one value’, the whole argument of CJI primacy , make the the CJI , ‘Holier than Thou’ among its own member and self defeats the meaning of concurrence. Blindsiding its own precedence :- One of the contentious issue with the NJAC was the – The ability of the two ‘eminent persons’ to veto any appointment flowed not from the 99th Constitutional Amendment but the NJAC Act. Therefore, it defied logic to render the entire amendment invalid solely because of this provision .It defied the “Doctorine of severability”. BRICS countries- Brazil, Russia, India, China and South Africa agreed for co-investment of resources for supporting multilateral R&D Projects in mutually agreed areas. The Indian delegation led by the Union Minister for Science & Technology and Earth Sciences, Dr. Harsh Vardhan, signed a joint Declaration called Moscow Declaration to this effect, at the 3rd Meeting of BRICS Ministers for Science, Technology and Innovation held at Moscow on 28 October, 2015. Note 1- The news of commencement of train as such is not important for civil service aspirants, but Buddhist Circuit is of paramount importance. Note 2-The funny part of this journey is you get to see Taj Mahal in Agra and how that is part of Buddhist Circuit, is probably a case for historians to answer, but for a traveler, it is probably an indispensable part of the journey , so it is a realistic promotion to keep Agra in the loop. society among communities in developing countries. Promote good governance through the efficient use of emerging e-governance technologies. to make it more regionally representative, democratic, accountable and effective. Indian companies, both multinational and SMEs, in Africa in a range of sectors. Both sides recognize that India was among the first emerging economies to propose a duty -free market access scheme for LDCs(least developed countries) . One of the most significant forms of Africa-India partnership has been the offer of concessional credit under the Indian Development and Economic Assistance Scheme(IDEAS) for implementing a range of projects as per the economic and social priorities of African countries in areas where Indian companies have relevant expertise. developing countries, especially the LDCs. through surveillance, and hydrography surveys. The China–Pakistan Economic Corridor (CPEC) is a ongoing development megaproject which aims to connect Gwadar Port in southwestern Pakistan to China’s northwestern autonomous region of Xinjiang, via a network of highways, railways and pipelines to transport oil and gas. 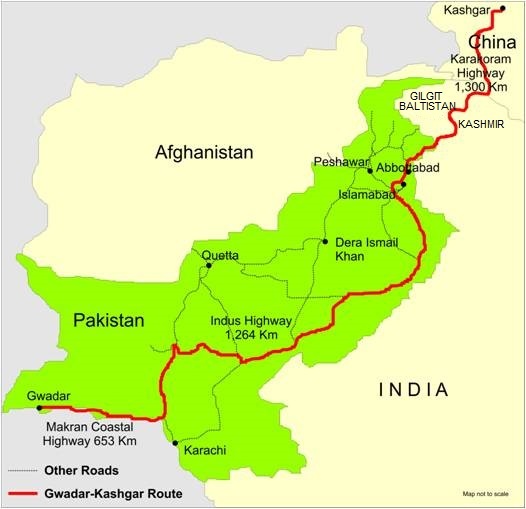 The economic corridor is considered central to China–Pakistan relations and will run about 3,000 km from Gwadar to Kashgar. Overall construction costs are estimated at over $46 billion, with the entire project expected to be completed in several years. According to experts, the completion of Gwadar would make it the economic hub of Balochistan and create a strategic nexus between Pakistan, China and Central Asia, generating billions in revenue and providing shorter land routes. It would provide links from the Caspian Sea to the Strait of Hormuz, and enable Gwadar to compete with Persian Gulf ports. The United States, wary of Chinese strategic access to the Arabian Sea and its presence in the region, has reportedly tried several times to persuade Pakistan against involving China in the development. The Karakoram (land) with Gwadar (sea) alignment has both commercial and military significance to serve as strategic chokepoints vis-à-vis India. It seems linked to preventing the Afghan-Pak area from potentially becoming a safe haven for Uighur militants once the U.S. troops leave Afghanistan. Beijing’s frantic initiatives for Afghan reconciliation talks explain that. India should start placing Gilgit-Baltistan (GB) plus Ladakh (82 per cent of J&K) on the centre-stage as a keystone policy to blunt both the Kashmir rhetoric and CPEC. It is also time to start working on Pakistan’s domestic resistance i.e. in Baluchistan, Khyber Pakhtunkhwa and Gilgit-Baltistan. India should explore opportunistic aspects in the OBOR (One belt one road)especially for regaining access to the northern axis, prevented by loss of (Gilgit-Baltistan)to Pakistan. Clearly, Russia and others would want India in the OBOR as a counterweight to Chinese influence. Regardless of economic interests, India can’t ignore the symbolic significance as it was along the Silk Route that Indian trade and philosophy (Buddhism) once travelled to the rest of Asia.